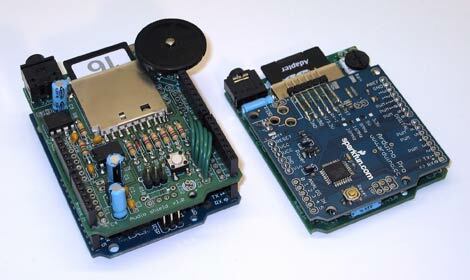 Most evident, a regular Arduino has been replaced with a wafer-thin Arduino Pro. Instead of using the standard stacking headers and arrangement, the Arduino board sits above the shield rather than below it, as this layout worked out to be a few millimeters thinner. Briefly considered an Arduino Pro Mini, but the pin headers in this stack hold things very securely, and the wiring is much cleaner (SPI signals can sometimes be touchy if the wiring is haphazard). Replaced the 3.5mm headphone jack with a lower-profile one (Digi-Key CP1-3525NG-ND), and similarly for the 10K trim pot (3352T-103LF-ND) since the click-to-power feature isn't really used by default, and the volume won't need to be changed after it's installed & calibrated. Left the ICSP header off the Wave Shield (will use one on the Arduino Pro instead if needed, since that board's on top now). All of the 100uF capacitors are laid sideways rather than upright. Similarly, the voltage regulator is bent face-down. Didn't like the slight rise to the FTDI header on the Arduino Pro, so I removed it and laid down a row of straight pins instead. Trimmed all the pins on the underside of the board after soldering, though it was really just sub-millimeter pedantry at this point. There's still ample ventilation space between the boards (5mm - the width of the caps lying on their sides), though heat's never really been a problem with this setup. Need to go get some Altoids now. Just for the tin, not the mints. Couldn't eat another thing, I'm absolutely stuffed. wow, beautiful! and so delicious! oh yes, that is a beautiful thing!